How to disagree without sounding like a jerk. You’re a small business or an entrepreneur. Why do you need a brand? Building relationships and starting projects. Having creators block? Feed your spirit. We work with amazing people who are not afraid to be different. | ARE YOU READY TO BE DANGEROUS? I’ve noticed many people don’t realize the importance of having a brand. Or maybe it is a term they are not familiar with. What is branding and why do you need it? Well, let me ask you this, how do you sell your products? How do you reach your customers and prospects? How are you standing out in your market? What are your values and beliefs in life? WHY SHOULD I BUY FROM YOU? Why should I buy from you and tell my friends and family to buy from you? The reality is if you have a business, you have a brand. And, branding is taking control of the culture of your brand by strategically positioning your business to your target audience. If you sell the best tomatoes in the world, how are you going to stand out? You’re going to tell your customers they are the greatest! But, they won’t listen? Get their attention! How if there are too many people selling tomatoes? Branding. You stand out by clearly defining your business to your audience and consistently applying your values to everything you do. From the way you answer the phone to the way you respond on social media. Do you choose eco-friendly packaging or do you double wrap and box? Do you greet your customers with a smile or do you silently stalk them throughout the store? Whatever impression you choose to leave, know that there is one being left no matter what. It is up to you to take control and manage your brand’s image to your advantage. 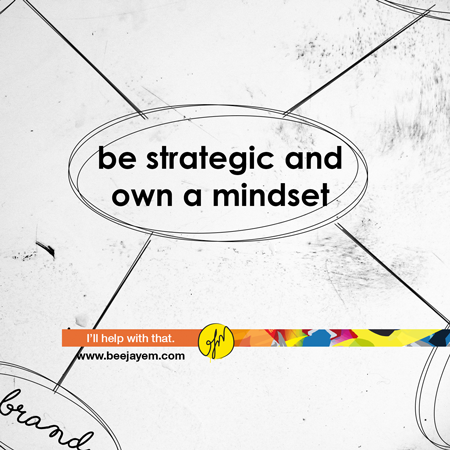 Be strategic and own a mindset.